My husband loves rice and gets cranky when we go too many nights without rice. When I was last visiting home in Hawaii, I had heard about the yaki musubi fad. Sadly, I did not get to Mana Bu's this time around. So I decided to try this on my own. Mine are definitely not as fancy as Mana Bu, but I still managed to get the idea of sticky/crunchy glazed musubi. It's important to use fresh hot rice. We usually make two batches--one that is Furikake-flavored, and one that uses chopped up shiba-zuke, the magenta-colored Japanese pickle. The beauty is in the flexibility. Once you have the technique, you can add Spam, salmon, ume, teriyaki chicken, or even char siu and green onions. I don't wrap in nori, but you can also add that. Make rice in the rice cooker. While the rice cooks, mix together shoyu and aji mirin. If you are making different kinds of yakiTake out about half the cooked rice in a bowl. 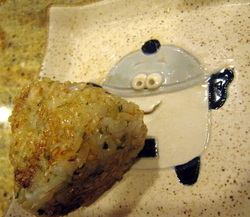 Mix in furikake to your taste and shape into the rounded triangular musubi. Try to make sure the face is as level and flat as possible. Drizzle a non stick pan with a bit of sesame oil. Use a brush coat one side of the musubi. Put glazed side down on the pan and then glaze the other sides. The rice will carmelize and get a little crusty. Flip and then turn to each side to brown/crunch all sides. If you are making a bunch of shiba-zuke musubi, repeat with the other half of the rice.